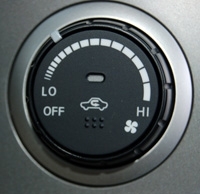 Temperatures over 90 degrees and high humidity can challenge your vehicle’s air conditioning system. Here are five easy tips from the Mobile Air Conditioning Society (MACS) Worldwide to keep you and your passengers cool on the road. 1. If possible, leave the windows down slightly on hot days to reduce heat build-up. An A/C system works by removing heat, so the cooler the interior is to start with, the easier and faster the A/C will do its job. 2. When you get in the car, open all the windows completely, or even open the doors, for a moment to vent the hot interior air quickly. 3. When you first turn the A/C on, set the controls to MAX or REC and use highest blower speed. This moves the greatest volume of air and re-circulates it for even faster cool-down. As soon as you are comfortable, switch the system to NORM or OUTSIDE or FRESH, and select a lower fan speed. The lower blower speed produces colder the air from the system. 4. Does your cool air have a bad odor, perhaps like “dirty socks” or a gym locker? Remember to set the system to the OUTSIDE air mode (not REC) frequently to help prevent or lessen this problem. 5. 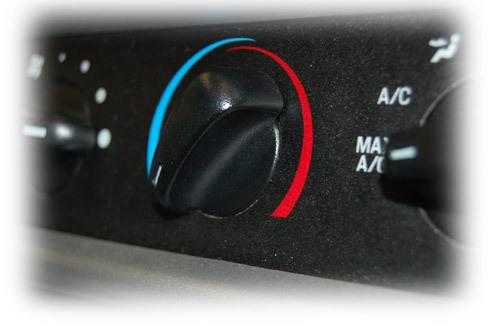 Automatic Temperature Control systems operate differently than manual systems. Read your owner’s manual to gain understanding of exactly how your system works. With most automatic systems, the quickest cool-down comes by setting the temperature as low as it will go at first, then adjusting it later to occupant comfort. This entry was posted in Automotive, Mobile Air Conditioning and tagged automotive, car, car care, environment, mobile air conditioning, vehicle. Bookmark the permalink.